After 55 starts, 26-year-old Justin Lofton won his first NASCAR Camping World Truck Series (NCWTS) race, the North Carolina Education Lottery 200, on Friday night at the Charlotte Motor Speedway (CMS). The win was the first for Lofton, his sponsor College Complete (http://www.collegecomplete.com, 877-543-2655), and his team, Eddie Sharp Racing (ESR) within NASCAR competition. This is amazing. This day has been coming for so long. These guys right here work their butts off week in and week out. 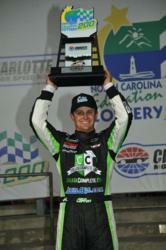 I want to thank them; I want to thank College Complete, Chevrolet, JoinAPS, SPEED Energy, my parents, Eddie Sharp. After 55 starts, 26-year-old Justin Lofton won his first NASCAR Camping World Truck Series (NCWTS) race, the North Carolina Education Lottery 200, on Friday night at the Charlotte Motor Speedway (CMS). The win was the first for Lofton, his sponsor College Complete(http://www.collegecomplete.com, 877-543-2655), and his team, Eddie Sharp Racing (ESR) within NASCAR competition. “This is amazing. This day has been coming for so long. These guys right here work their butts off week in and week out. I want to thank them; I want to thank College Complete, Chevrolet, JoinAPS, SPEED Energy, my parents, Eddie Sharp. This is just amazing,” an elated Lofton said from victory lane. Lofton was a clear contender early in the day after posting the second fastest time in final practice and qualifying second for the 200-mile race. Once the green flag waved however, Lofton lost a few positions while getting up to speed. Two caution flags waved within the first 13 laps, and after losing track position at the start, Lofton and crew chief Dan Bormann decided to make an early trip to pit road for fuel. After the stop, he took the restart on lap 17 from the 24th position. Within 10 laps, Lofton found himself on pit road yet again under a caution flag. This time, Bormann called for two tires and fuel. Lofton rejoined the race in 13th.Once he took the restart, Lofton was silent on the radio. As team owner and spotter Eddie Sharp called him around the 1.5-mile track, Lofton stayed focused on the task at hand. By lap 60, he had climbed his way back into the top-10. As teams began their next cycle of pit stops while under green flag conditions, Lofton stayed on track. Bormann was confident that under the previous pit stop, his crew had plugged enough fuel into the No.6 College Complete Chevrolet to not rush into the pit cycle. As luck would have it, they were able to stay on track until a caution flag waved on lap 72, allowing them to pit under yellow. After stopping on pit road for four tires and fuel, Lofton was scored in the second spot for the restart on lap 75. With 50 laps remaining, the yellow was displayed yet again. As other leads opted to head down pit road for their final stops, Lofton stayed on track. Crew chief Bormann had planned to call Lofton down for another stop, but radio traffic prevented him from relaying the message to his driver. Team engineer Eddie Troconis quickly hit his notes and began recalculating the fuel mileage, taking caution laps into consideration. The missed pit call moved the 6 truck to the top of the leaderboard for the restart. Lofton held the position until lap 119 when Brad Keselowski took the spot from the California native. Two laps later, the yellow flew yet again. While under caution laps, Lofton radioed to Bormann and his crew that he felt like his Chevrolet was “losing the nose.” Bormann reminded him to do what he could and to save as much fuel as possible. The restart came with 10 laps to go. Lofton took the green from the outside lane. As Keselowski led the field up to speed, Lofton was able to take advantage of a dicey melee in the bottom lane, allowing him to reclaim the lead. As he drove by Keselowski, the caution waved for the eighth and final time for debris. The final restart fell on lap 129, leaving five laps left to run. Once the green flag was displayed, Lofton pulled away, and drove the No. 6 College Complete Chevrolet to the finish to claim his first career checkered flag. Despite his early struggles on restarts, the third year Truck Series driver got it figured out when it mattered most. Lofton now holds one win, three top-fives, and five top-10s after the first five races of the season. The win boosted him to the NCWTS point lead for the first time in his career, by one point over Timothy Peters. The next race for Lofton and his College Complete team is June 1 at Dover International Speedway. Lofton has a best finish of third at the one-mile track, tallied during his rookie season in 2010.